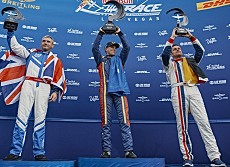 Australian pilot Matt Hall has stormed to victory in the final Red Bull Air Race of the season at the Las Vegas Motor Speedway on Sunday but his second victory of the year wasn’t enough to overhaul Paul Bonhomme for the world title. Needing to win or finish second in Las Vegas to have any chance of catching Bonhomme’s eight-point series lead, Hall delivered in spades – but with the Englishman finishing second the title was just out of reach. It was still a watershed year for the former RAAF fighter pilot who finished on the podium in seven of the eight races on the calendar and improved last year’s sixth place overall by four places. Prior to the 2015 season Hall had five career podium finishes to his name and was yet to claim a race – now he has stepped onto the dais 12 times and won twice. Hall began the day by defeating Hungarian great Peter Besenyei by 1.8 seconds in their man-on-man Round of 14 clash in a heat where both pilots hit a pylon. Immediately after he touched down, Besenyei, considered the ‘Godfather’ of the Red Bull Air Race, announced his retirement from the sport. In the Round of 8, Hall squared off against Czech Martin Sonka, the only man to stop the Australian in that round all season when he caused a boilover to defeat the red hot Australian in Budapest in July. In the end Hall won that battle easily after Sonka was hit with five seconds of penalties and the 43-year-old Australian set his sights on the Final 4. Flying second after German Matthias Dolderer, Hall smashed the track record then held on as Japan’s Yoshi Muroya and Bonhomme tried in vain to knock him off the top step. “I knew I had nothing to lose when I flew that Final 4,” Hall said.